Some 40 million Americans are now over age 65, and about 6 million are over 85. In the land of Denny’s, anyone over 55 can order the senior platters. Would I be right in guessing that 30 million American children spend part of their time looking after their parents? Like many baby boomers, I spend a considerable amount of my time in the company of my ninety-something parents. That involves fixing meals, opening car doors, reading Maureen Dowd aloud from the newspaper, adjusting hearing aids, listening to doctors, cleaning out the garage, and cajoling them to eat more or less food. Many care days are a blur of pill administration, shopping, desk sorting, gas-filling, and lunch preparation, to the point that, instead of actually visiting with my parents, I become just another worker on the assembly line of old age. Keep in mind, too, that my parents are among the luckier senior citizens, in that they have savings to invest in their quality of life, and the time that I devote to them is, while considerable, part-time. Both are sustained by a devoted network of caregivers who do the heavy lifting into the showers or out of the chairs. . In the last four years, my mother has had several bouts of pneumonia, a broken hip, and memories closer to the summer of 1938 than to yesterday’s events. In January of this year she was consigned to hospice, only to “graduate” some weeks later. After the doctors stopped her medications, with only the medicine of love — daily visits from my father, the company of my sisters, and a companion — she willed herself more time, and even now walks to dinners. My father does not see, hear, or walk particularly well, yet thanks to his courage and his care group, he still occasionally commutes to his office in New York and leads inspirational seminars for those less fortunate than he is. On a recent visit, I took him to a New York City book party, a Revolutionary War museum, and a high school graduation. On his own, he attended a board meeting. In economic terms, my parents’ old age is a cottage industry, providing all sorts of work for aides, nurses, orderlies, doctors, hospital staff, gardeners, and the like. They live in a retirement community, which has many benefits, mostly the company of stimulating friends. Across much of the United States, golden years are seen in much the same way that Eskimos look upon a beached whale. 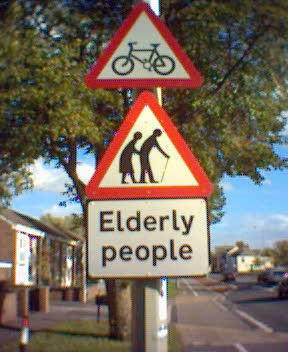 It makes sense that the elderly would be easy marks. They have savings from a lifetime of work, are vulnerable and need help, and staying alive is a good use of their time and money. In the cost-benefit analysis of old age, is it worth it? This question came up during the recent health care debate, in which the specter of “death panels” was raised as a coded phrase to ask whether the elderly use up too much of society’s assets. The projection is that twenty percent of the population will be over age 65 in 2030, when the U.S. will have the same demographics that Florida has today. Like everyone else, I have watched the television reports about ninety-five year old patients, terminally ill with cancer, being given hip replacements. No wonder the annual budget of the American Association of Retired People is $5.5 billion, in part to block a rise in the retirement age to 70 or 72. When 65 was chosen, only two to three percent of the population lived beyond that age. Think of 85 today. As an investment, old age does not look like much of a deal. Caring for older people is ruinous to public and private balance sheets. Medicare and Social Security, if left unattended, will bankrupt the United States. Even if the country picks up some of the $51 trillion in projected medical and retirement benefits, families themselves will still pay billions for private nurses, retirement homes, and uninsured medical costs. Think of how many families lose their life savings in the last years of their parents’ lives. The nursing home "tax" precedes that of inheritance. Admirable as is the goal of universal health care, its bottom line is to transfer even more money into the accounts of those in the senior-citizen business. Health care is approaching twenty percent of the domestic economy, and a disproportionate amount of that money goes to profit centers that benefit from the elderly. Does America have crumbling infrastructure because its seniors are living well into their nineties? Here is a contrarian view: Rather than looking at old age as a bad investment, I tend to see it as a gift that cannot be measured in economic terms — something closer to Thomas Jefferson’s “life, liberty, and the pursuit of happiness” than to a negative cash flow statement. To be sure, looking after elderly parents is an emotional and physical strain. The days start early and end late, and involve sadness and frustration. I can say, however, that I enjoy my parents’ company, in their nineties, as much as I did when I was growing up or when they were in their fifties and sixties. For starters, older parents are great listeners, and mine love nothing more than the narrative of their children’s and grandchildren’s lives. I am just back from three weeks in their company, and in many ways all we did was talk—old age as a Viennese café. From friends I got snatches of conversation while they glanced at their iPhones or rushed off to meetings. From my parents I got hours, even days, of their undivided attention. Thanks to my parents’ old age, I have also learned a lot about the American Revolutionary War, as on each visit to them I lead an expedition to a New Jersey or Pennsylvania battlefield. In recent years, between all the medical crises, I have driven them to Monmouth, Valley Forge, Brandywine, Trenton, Princeton, Germantown, Morristown, Rockingham, and Somerville, and we have talked endlessly about Washington’s failings as a general, General Charles Lee’s court martial at Monmouth, and the British preoccupation with the spice islands, diverting subjects that we all prefer to dementia’s 36-hour day. More than the pills, I think it’s the shared company and the laughter that keeps my parents alive. I read Onion headlines to my father (such as “Supreme Court Upholds Freedom of Speech in Obscenity-Filled Ruling” or “Pope Forgives Molested Children”). While we were watching golf, my mother gave me a knowing look when the announcer mentioned Tiger Woods. During my mother’s illness this winter, we adult children rushed to her bedside. But then, as we had not been together in a while, we started talking and laughing amongst ourselves, even though the doctor had given her about three days to live. Although we were sitting around a hospital bed, it could have been the patio of our childhood home. Later that day, my mother said to my younger sister, “This is fun. We should do this more often.” She’s still with us. Matthew Stevenson is the author of Remembering the Twentieth Century Limited, winner of Foreword’s bronze award for best travel essays at this year's BEA. He is also editor of Rules of the Game: The Best Sports Writing from Harper's Magazine . He lives in Switzerland. Submitted by alexmargarate on Mon, 09/09/2013 - 04:37. Effects of growth hormone in adults health....In children , growth hormone stimulates growth. Adults also need growth hormone to maintain a healthy body. e.g. , growth hormone helps to regulate the amount of fat , water and muscle in the body. Submitted by Henry Ehrlich on Thu, 07/22/2010 - 11:16. Sir, you are indeed fortunate that your parents are resilient enough to continue to enjoy life, and you enjoy them. However, before we make generalities about the policies that attach to longevity, such as retirement age, we have to recognize that not all lives and work are alike. My father, like yours continued to lead an active professional life into his early eighties, when dementia did his career in. But he was a writer and a lexicographer. He wasn't a miner or a plumber or a farmer or a mechanic or a Walmart customer service specialist. Neither was he living in fear that "the boss" would find a pretext to ditch him and hire younger or cheaper labor, or offshore his monumental knowledge and skills that kept his publishers coming back for more. What are all those younger people who are looking for jobs going to do anyway? People forget that Social Security began in part as a way of removing old folks from the labor market so that young ones could take over. As for those of us who consign huge blocks of our own middle age to caring for aged parents, not everyone is well-heeled enough to afford to pay for the heavy lifting. And not every family, or indeed every geography (including the very affluent one where my parents lived and died) is stocked with wise and experienced professionals to help families distinguish between a swoon and the "big one." As we know, death panels weren't death panels. What they were is something this country desperately needs. In may parents' case, there was a point of diminishing returns, and they knew it, but there was no wise, competent mechanism to help any of us. Two cheers for death panels. Submitted by davebarnes on Sat, 07/10/2010 - 16:07. As an "old fart" of 61, I think the retirement age should be raised. ! month per year for the next 5 years. Starting now. We need to adjust our mindsets that 65 is not old and ready to stop working.